A complete and thorough understanding, about the inside out of your customers and catering to their needs accordingly, is the ultimate road to leading your domain market. If you are an FMCG company, you are dealing with large number of point of sales in retail stores. Thus arises the need for a carefully done tool that suits this situation. Unfortunately most SFA (Sales Force Automation) products thoroughly miss this point and treat Customer Profiling simply a matter of master data. A few months into the deployment most customer grapple with making any sense of the generated data because they cannot trust the base itself. To solve this problem, we bring to you an amalgamation of features; meticulously planned and strategized in ‘BeatRoute’ mobile app platform. Store Profiling means identifying the needs and characteristics of each and every store. This in return helps define the range, merchandising, pricing, advertising, and promotion for each of those stores. Thus, helping in running differentiated engagement campaigns for better sales. What are the recurrent complications faced by companies? There is a fair amount of things that could go wrong in this domain. The prior most being- not knowing enough about the targeted stores, resulting in missing out on opportunities. Duplication of stores in the internal data, is another aspect responsible for wasting valuable resources and time. And entirely missing or wrong geocodes of the stores, is a major issue which might result in deteriorating the ability of your field team. How BeatRoute is a problem solver when it comes to Store Profiling? Smart Customer Profiling- The first step to effectively profile your customers is to understand the different aspects of a store, and then divide them accordingly. 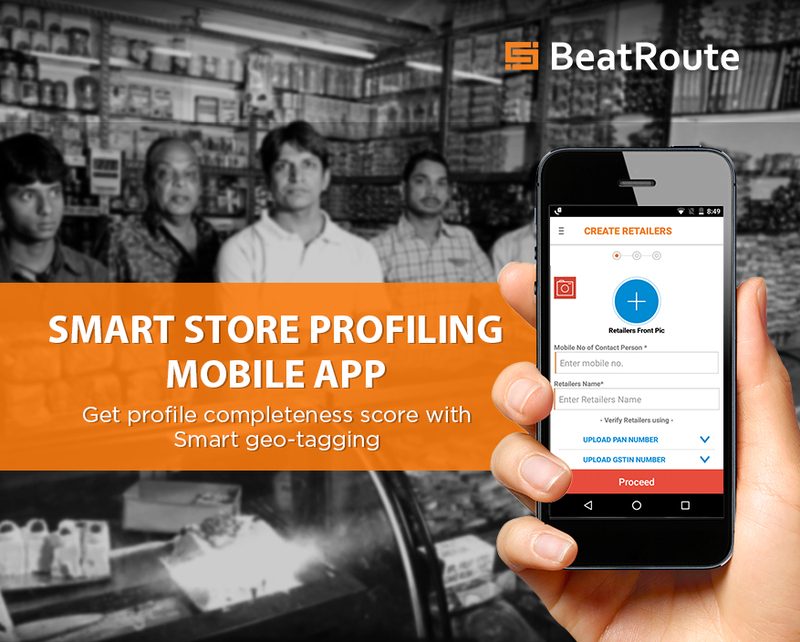 BeatRoute allows you to list a store’s type and subtype along with pictures and custom fields; thus giving you and your field team an access to the minutest of details related to a store. Our workflow is most apt or distributed teams that cover large customer landscapes. Geo-location Based Intelligence- The most important feature that BeatRoute proudly boasts about is its geotagging feature. With it, all the stores are geotagged automatically on the app, making it possible to track which customers have been touched which have not been. Each visit and an agent’s entire journey can also be saved and reviewed in the app itself. BeatRoute uses an AI-powered engine to automatically detect which stores have been geo-tagged accurately and locks their location. Route Optimization Algorithm- BeatRoute comes long with a Route Optimization solution that helps you divide a territory in the most efficient manner between various routes and their beat schedules. It works on the concept of optimizing your objective function while meeting certain defined constraints. Pick one of your existing territories and we will show you how you can save cost and maximize sales. Interest? Offline Sync- If you are still worried about your data getting lost because of no or low internet connectivity, you need to stop worrying. Each feature of BeatRoute is designed in such a way that it works perfectly fine even without connectivity and each information gets synced as soon as the phone comes in a network area. Deduplication Engine- Its profiling engine is designed in such a way that it leaves negligible chances for a store to be listed more than once, even if the customer name is written in two or three different ways like Alex Super Store and Alex Sup St. BeatRoute’s machine learning routine enables an accuracy rate of 95%. Wondering how many duplicate customers you have in your database? It’s easy to check. Just show your interest and submit your sample territory data here. One can use Customer Profiling module as part of the entire platform or stand-alone in integration with other CRM, Sales Execution or Lead Aggregation systems. It is one of the most trusted apps and is used by hundreds of companies big and small such as Valvoline, Pepsico, Perfetti, Danone, Money on Mobile, ePayLater to name a few. Interested to know why and how Pepsico did this for their entire retail landscape in 6 months.? Just drop a request here.